Since late 2008, tourists have taken to attaching padlocks (love locks) with their first names written or engraved on them to the railing or the grate on the side of the bridge, then throwing the key into the Seine river below, as a romantic gesture. This gesture is said to represent a couple’s committed love. Although this is not a French tradition and has only been taking place in Paris since the end of 2008, with locks occasionally being cut off by city workers, since 2012 the number of locks covering the bridge has become overwhelming, with locks being attached upon other locks. 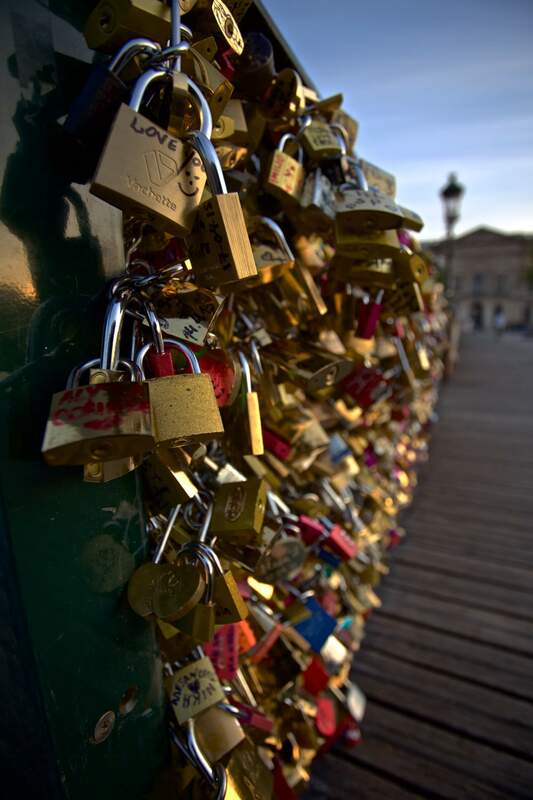 In February 2014, Le Monde estimated that there were over 700,000 locks; with the 2014 summer tourist season, many thousands more have since been added, creating a serious safety concern for city authorities and an aesthetic issue for Parisians.